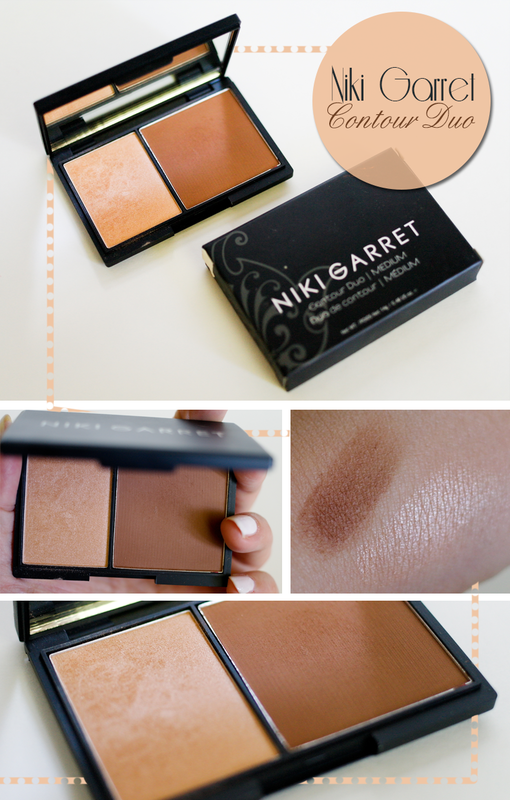 This is one of the best contour kits I've used to date. I think I like it just as much as I like my Anastasia Beverly Hills contour kit, and this one here is just a fraction of the cost of the other one. I have a relatively fair skin, especially after the long Buffalo winter, so I thought the contour kit in medium might be a bit too dark for my skin tone, but it's actually a perfect match. The contour powder is matte and kind of a warm chocolate color. It's easy to apply and blends very well, so if you're pale like me you can apply very little of the product and make your face look very nicely sculpted and more attractive. The highlighter is very sparkly and glowy, with some gold speckles in it that give you this incredibly nice, sun-kissed, glowy look. I think it will look even more beautiful in summer time when my skin will be more tanned than now. This is a powder kit and it's super fine, which means it doesn't settle in the fine lines and wrinkles like some other highlighters and contouring powders. It's a long-lasting product, too. It stays in place, doesn't smudge or rub off, and there is no need to re-apply the product throughout the day. I find myself reaching for this kit on daily basis and really enjoying adding some extra dimension to my face. My face shape is more on the round side, so contouring in the hollows of my cheeks, a bit on the side of the nose, next to the hairline on my forehead and just a bit on my chin, really makes my face look slimmer and prettier. My nose is pretty long, too and that's something I've always been very conscious of, so putting just a bit of the contour powder on the tip of my nose makes it visually shorter and more attractive. I just love the look I can achieve thanks to this product. Disclaimer: I received a free review sample for evaluation purposes. All thoughts and opinions are my own.